Taco Brothers is a Mexican-themed slot from ELK. The theme is digging up a few Mexican stereotypes, especially the clothing, which are used for the purpose of making the game a bit funnier. The Taco Brothers are thieves who try to rob a safe, and of course, in this game, you'll be the one reaping the real rewards! The symbols include the three brothers, a safe, an exploded open safe, tools, booze and of course a guitar and a cactus! The style of the graphics is very nice, and they were drawn with a lot of attention to detail. The music is rather tame, but the sound effects really liven up the action! The main features of the game are wild substitutions, re-spins and free spins with possible multipliers. The variance of the Taco Brothers slot is low to medium, which means that you can often have winning combinations with lower amounts, but also larger amounts every now and then. The special features trigger regularly and will keep you entertained throughout the game. The theoretical return to player is 96.3%, which is similar to other online slots from ELK and a very average payout. It is also possible to play Taco Brothers mobile, as the games are developed for mobile use. 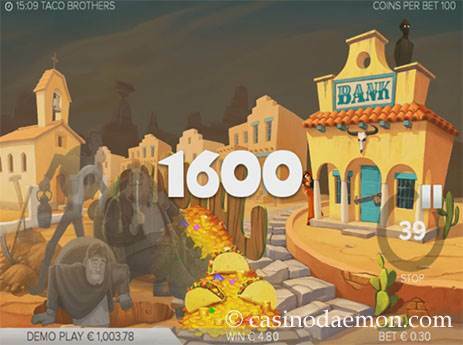 On this page you can play Taco Brothers slot for free and try the game without any obligation or risk. If you like it and want to try it for real money you can play it at one of the online casinos mentioned on this page. The slot is not particularly packed with features, but what it has to offers is interesting regardless. The wild symbol with the bell can stand in for other symbols to create or complete winning combinations, but it doesn't replace the scatter with the safe. The re-spin triggers when you get Taco Brothers Wild on the screen. Two symbols trigger a re-spin of any reel that is not holding a safe or another Taco Brothers Wild symbol. 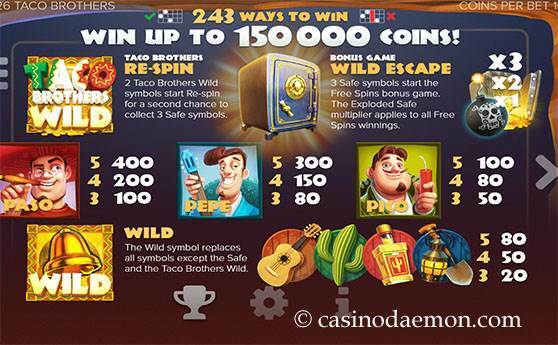 The Taco Brother Wild symbol will give you another chance to trigger the free spins. The safe symbol is the symbol that can trigger free spins when you get it 3 times anywhere on the reels. The safe symbols will then show multipliers of either 1x, 2x or 3x, and one of them will explode, which will determine the multiplier that gets applied to the free game winnings. 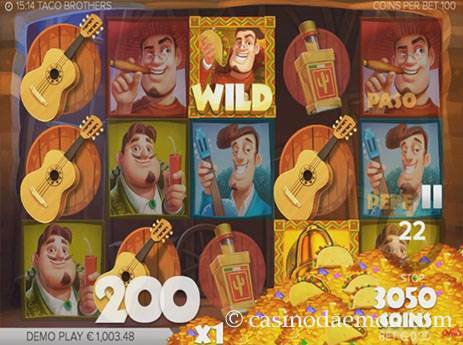 During the free spins you also get two special symbols, the pretty Senorita and Captain Diaz. The Taco Brothers turn into running wilds and the Senorita will keep the Taco Brothers in the game by pushing them to the right, but when Captain Diaz appears he will imprison the active brother. 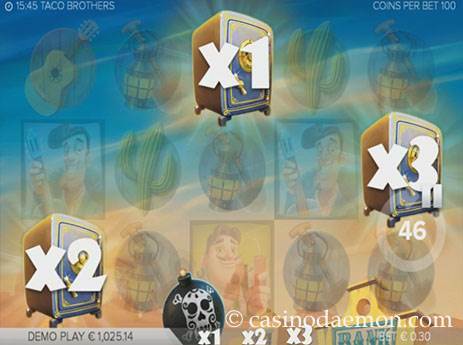 Once all brothers have either left the screen or have been imprisoned the free spins end. This means that there is no set amount of free spins that you can get, and with a bit of luck they can go on for a while. The Taco Brothers slot has 5 reels with 243 ways to win. Winning combinations are formed with symbols on adjacent reels, regardless of the position on the reels. The slot is played with 100 coins each round. The minimum bet is £/€/$ 0,10 and you can raise your stake up to a maximum of £/€/$ 50. You can also select automatic play and betting strategies.